Grits aren’t just for breakfast! This simple bowl is a great dish that can be prepped in advance for a quick weeknight dinner or side dish. Toasted breadcrumbs add a nice texture, while chili oil brings some heat to the party. There are no rules here. Build this satisfying bowl however you want. Make the Grits: Bring chicken stock or water and salt to a boil. Stir in the grits and butter and reduce heat to low, gentle simmer. 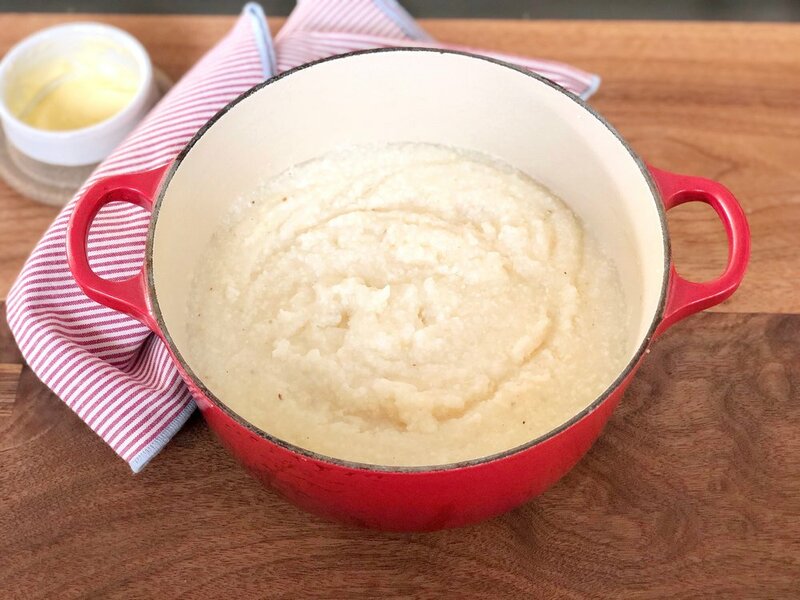 Cook for 20 minutes, stirring occasionally, until grits are thick and creamy. Remove from heat, stir in more butter, salt and pepper to taste. Store grits in an air tight container in the fridge for 3 days. Make the Kale: In a large sauté pan, heat oil over medium-high heat until it shimmers. Add garlic and cook until fragrant, about 1 minute. Add the chopped kale, chicken stock and a pinch of salt and pepper. Cook the kale, stirring occasionally, until it is soft and tender and liquid has evaporated, 7-10 minutes. Stir in the lemon juice, taste and adjust seasoning. Set aside and keep warm. Make Breadcrumbs: Roughly tear bread and place in the bowl of a food processor. Pulse into coarse crumbs and then toss the breadcrumbs with olive oil or butter and salt. Set a skillet over medium heat, add the breadcrumbs and cook, stirring occasionally, until brown and toasty, 5-7 minutes. Build your Bowl: Spoon warm grits into a shallow bowl, top with sautéed kale and garnish with breadcrumbs and chili oil.